“You don’t have to be Jewish to love Levy’s” rye bread, as the famous ’60s ad campaign proclaimed. And you don’t have to be Jewish to feel a strong connection with the U.S. Jewish community. A major new Pew Research Center survey of American Jews includes an analysis of the views and characteristics of non-Jewish people with a “Jewish affinity.” This group includes those who identify with a religion other than Judaism (in most cases Christianity) and have no direct Jewish ancestry, but who nevertheless consider themselves to be Jewish in some way. This group represents 0.5% of U.S. adults, or about 1.2 million people. 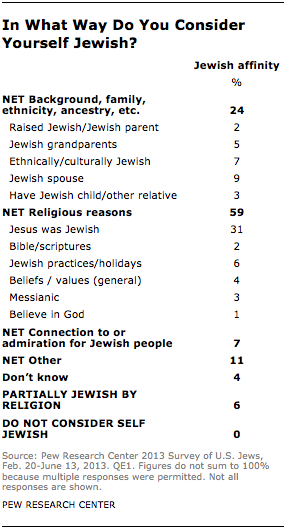 Six-in-ten of those in the Jewish-affinity category say they think of themselves as Jewish for religious reasons, including 31% who say they are Jewish because Jesus was Jewish. Smaller portions consider themselves Jewish because they observe Jewish practices and holidays (6%) or have shared beliefs and values (4%). About a quarter of those in the Jewish-affinity category say they consider themselves Jewish because of an ancestral or familial connection. This includes 9% who say they have a Jewish spouse, 7% who say they are ethnically or culturally Jewish, and 5% who volunteer that they have a Jewish grandparent. People of Jewish affinity are almost as likely as U.S. Jews to say they feel very emotionally attached to Israel (26% vs. 30%). And they are somewhat more likely than Jews to say that the United States is not sufficiently supportive of Israel (41% vs. 31%). But compared with people who say they are Jewish by religion, those of Jewish affinity are far less involved with Jewish institutions. Relatively few live in a household where someone belongs to a synagogue (4%) or another Jewish organization (7%). While these levels of organizational involvement roughly match those seen among secular Jews, they pale in comparison with those of Jews by religion. One-in-four people in the Jewish-affinity group say they contributed to a Jewish charity in 2012. By contrast, two-thirds of Jews by religion donated to a Jewish charity last year, as did one-in-five secular Jews. When it comes to their political attitudes, those with a Jewish affinity are more conservative and Republican than either secular or religious Jews. As a whole, Jews support the Democratic Party over the Republican Party by more than three-to-one: 70% say they are Democrats or lean toward the Democratic Party, while 22% are Republicans or lean Republican. By contrast, the Jewish affinity group is evenly split politically, with 42% saying they are Republican or Republican leaning and 41% saying they are Democratic or Democratic leaning. Four-in-ten people in the affinity group describe themselves as politically conservative, compared with only 19% of Jews.